Fair. 0853314950 Please allow 4-14 business days for Standard shipping, within the US. Thank you for supporting our small, family-owned business! Used-Very Good. Very nice clean, tight copy free of any marks. Wrapped in complimentary Brodart dust jacket protector. Very Good. Light sunning to cover. Unmarked clean pages. Very Good. Exlibrary, usual markings. Rebound. 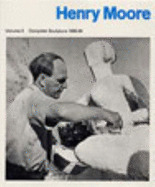 Title just "Henry Moore"; 165 pages.